In Canada, the NBCC 2010 sets out technical provisions for the design and construction of new buildings. For the purposes of load combinations, Part 4 of the design code provides specifications for limit states design. In general terms, limit states are the conditions that result in the building ceasing to meet its function that it was designed for. Limit states are categorized as being an ultimate limit state (ULS) or serviceability limit state (SLS). ULS is concerned with safety (e.g. capacity, overtuning, sliding, fracture), whereas SLS is concerned with inhibited intended use and occupancy of the building (e.g. cracking, deformation, vibration). ULS involves five basic load combination cases. 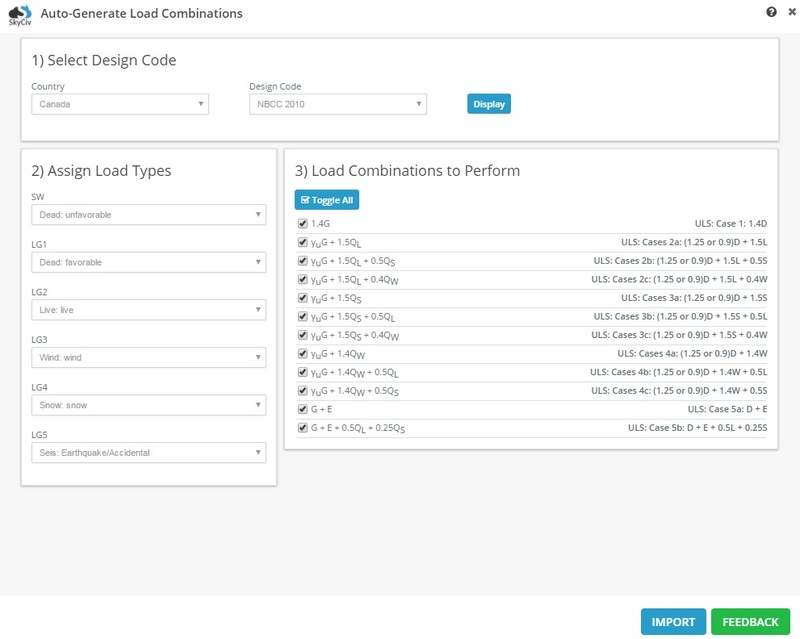 This article will focus on how SkyCiv’s auto generated load combinations feature meets the load combination equations as specified in NBCC 2010 for ULS. γuG + 1.5QL + 0.4QW Since there is an “or” in the companion load, when considering no companion load as an option, a total of 3 equations are generated. SkyCiv represents this with 3 load combinations. The factor for the dead load may be either 1.25 (unfavorable) or 0.9 (favorable). 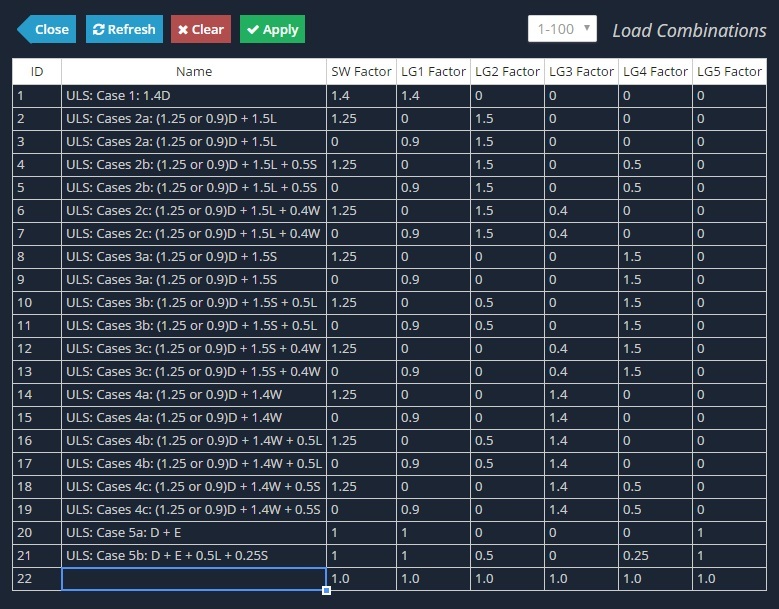 SkyCiv offers you the option to assign your load groups to the “Dead: unfavorable” or “Dead: favorable” load types which will apply the factors accordingly. Each SkyCiv load combination here will only generate one equation. γuG + 1.5QS + 0.4QW As above. γuG + 1.4QW + 0.5QS As above. G + E + 0.5QL + 0.25QS This case generates 2 equations when considering the principal loads alone, or the principal loads and companion loads together. SkyCiv represents these by two separate equations.